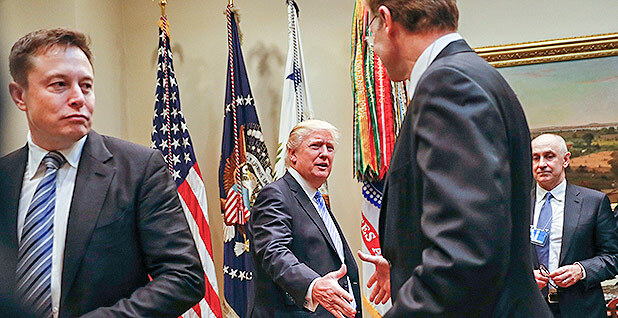 Elon Musk (left), CEO of Tesla Motors Inc., walks in the Roosevelt Room of the White House last week as President Trump greets Corning Inc. CEO Wendell Weeks. Photo by Pablo Martinez Monsivais, courtesy of AP Images. The country's top businesspeople are building relationships with President Trump, but nobody speaks for the future of technology quite like Elon Musk. As the CEO of Tesla Motors Inc. and SpaceX, and a member of Trump's business and manufacturing councils, Musk has a promising but delicate task. He is one — perhaps the only — person close to the president who can advocate on behalf of four budding sectors: electric vehicles, solar power, energy storage and commercial space travel. What does Musk want from Trump, and Trump from Musk? E&E News invited people from across the spectrum of Musk's industries to share what they think (or hope) these two leaders are talking about. The two began far apart. Four days before the election, Musk said on CNBC that Trump was "not the right guy," while Trump focused his campaign attention on reviving the coal industry, a sympathy at odds with the goals of Musk's clean energy businesses. Since then, the two have drawn steadily closer. Musk was a late addition to Trump's business council, which originally was almost devoid of Silicon Valley companies, and on Friday was named to a new manufacturing council. Earlier this week, Musk took to Twitter to endorse Trump's pick for secretary of State, Rex Tillerson (Greenwire, Jan. 26). On Saturday, as Trump's executive order on immigration exploded into controversy, Musk commented on Twitter that the Muslim ban was "not the best way to address the country's challenges." Yesterday, he appeared to be trying to build a bridge between Trump and opponents of the order. He asked for proposed amendments and wrote "Will seek advisory council consensus & present to President." The blow-dried Manhattanite and the native-born South African have met at least twice, and while hints have emerged — Bloomberg reported that Musk floated the idea of a carbon tax — the rest of their interactions remain behind closed doors. Musk, 45, would seem to appeal to Trump for one obvious reason: jobs. Tesla employs more than 6,000 people at its auto manufacturing plant in California and is expanding. Meanwhile, it has promised to hire 6,500 at its gigafactory battery plant in Nevada and at least 500 at the new solar panel manufacturing plant at SolarCity Corp., which Tesla acquired two months ago. Musk's pitch to Trump is a bit more fraught. SpaceX and Tesla received about $2 billion in various subsidies from the Obama administration. Musk would probably like to count on new federal dollars from Trump, but conservatives have criticized Obama's support of Musk as handouts. Furthermore, as the head of Tesla, Musk represents the country's largest electric vehicle maker, the largest rooftop solar installer and a leading provider of grid-scale energy storage. Trump has expressed little enthusiasm for these, and the emphasis on "clean" energy is at odds with the president's goal to resuscitate the coal industry. In any case, Musk's role as Trump's confidant appears to be making Wall Street more confident. Tesla's stock has risen 28 percent since the beginning of December. What should the two men be discussing, when there are so many things to discuss? Here, some interested parties weigh in. "Definitely, they are talking about manufacturing jobs on American soil. They are talking about the future of renewables. They are talking about what different protectionist trade policies can do to help or harm an industry. I'm sure they will be talking about government contracts over time, if not in the first meeting. They are about how to bring Silicon Valley closer to the administration. "We, the advanced energy industry, have big faith in Elon being able to shape the view of the administration. He can be a voice of sanity in the room when decisions are being made about industries such as renewables, which don't seem to be on the top of the agenda for the new administration. "I hope he's the guy who's going to persuade the administration that coal is done." "Where common ground could be met is eliminating duplicative regulations that are stifling business, whether it's restrictions on selling cars directly to consumers rather than to the dealership, or whether it's removing environmental regulations. Like having to go through an extensive NEPA [National Environmental Policy Act] process for building on federal land, or an overly regulated electric grid that makes it harder for new technologies to reach the market. "We aren't fans of a lot of the policies that Elon has been doing to enhance his own bottom line. There are a lot of policies that would make it 'Buy American' without any subsidy attached to it." "I see a couple of things in it for Musk. You don't have to look very hard to find stories expressing concern about the viability or the financial structure of Tesla, and especially after the merger with SolarCity. One of the interesting challenges for him is that he's burning through capital, continuing to acquire financing, so I suppose a conversation with the self-described 'king of debt' might have some benefits there. "In Trump's case, what he's got is a chance to associate with someone who has a pretty big 'wow' factor and who he can hold up as a poster child of entrepreneurship in the private sector. Musk sits well with the Republican ideology that we have lots of talent out there, and if we just unleash it, then the market will do it all on its own. "But Musk has gotten a lot of government money along the way." Chris Prophet, author of "SpaceX From the Ground Up"
"To my mind, there's little doubt Elon Musk wants to gain Donald Trump's official approval for SpaceX efforts to colonize Mars, which should help overcome regulatory roadblocks. If Elon gains the president's support, it seems likely he will also try to solicit some kind of federal funding for these efforts. "Donald Trump's motivation for arranging these meetings are manifold. Certainly, he has gained worth by association simply by meeting Elon Musk. Also it makes him appear less close-minded by demonstrating his willingness to listen to tech-savvy advisers. Lastly, he wants to be viewed as a great mover and shaker; hence even hinting at such bold endeavors as Mars colonization should help burnish his reputation." "It's safe to say that it was likely Musk and Trump discussed corporate tax reform. Musk is going to be keenly interested in any reform that slashes tax liability [and] rates for domestic manufacturers. "On energy policy, I've always thought that Trump will simply continue Obama's 'all of the above' mantra — with the only difference [being] that Obama's cut out coal. I see a continuation of support for renewables as well. If Trump is able to cobble together an infrastructure plan, I'm sure Musk reminded him of the need for federal investment in electric vehicle infrastructure to be part of that package." "They're different personalities. Elon Musk is actually quite complicated, and I see Donald Trump as quite simple. "What makes [Musk] so complex is that he has all these various visions for society that he then goes out and starts businesses around. He's a promoter, he's a manager, he's a visionary. Pretty complex set of skills. His recent businesses always depended on government largesse. He's got to have a good relationship with the government. That's what's in it for Musk. "I think what Donald Trump wants is pretty clear. He wants from Elon Musk what he wants from everyone: adulation. And I'm sure he'd like Musk to create more American jobs. Musk has his own adoring community, and Trump would like some of that adulation turned his way."